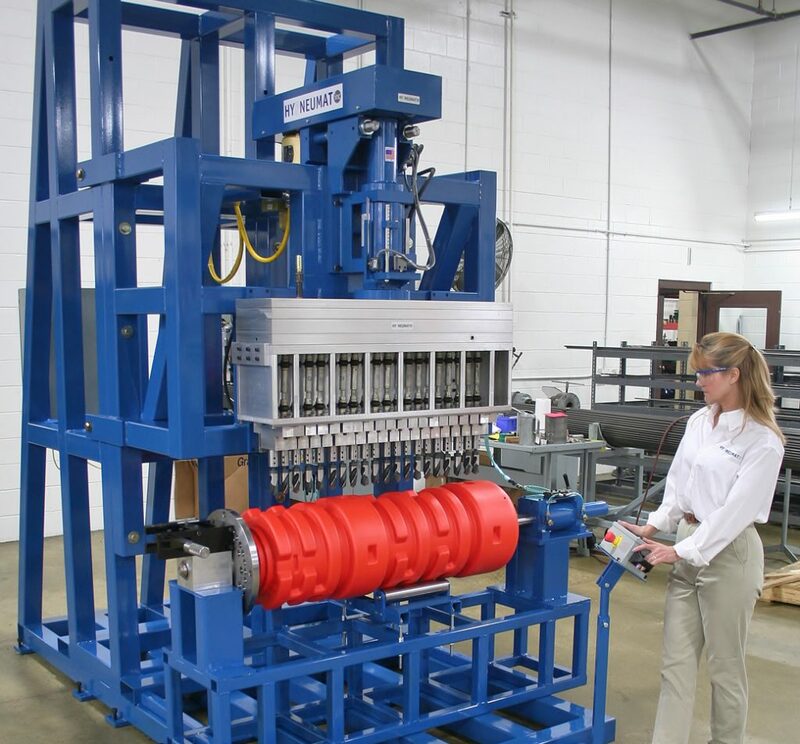 20 Spindle Drilling Machine | Hypneumat, Inc.
Hickenbottom, Inc. needed a reliable replacement for an old drilling machine. Hypneumat listened to the client’s needs and delivered an idea to increase the company’s production with reliability and longevity that will last for decades to come. THE BACKGROUND: Hickenbottom inlets are utilized in a variety of commercial, recreational, agricultural, and municipal applications. Each inlet is made of high-density polyethylene insuring the longevity and durability of the product. They needed the same in the machine that drills them with the versatility to drill a wide range of inlet sizes. THE CHALLENGE: The client needed a multiple spindle drilling machine to drill twenty (20) 1-1/4" holes in a 24" HDPE inlet pipe and also capable to drill their current 12" (15" OD), 15" (18" OD), 24" (29 1/2" OD) and possibly 36" inlets in the future. Reliability and longevity was a paramount concern. THE DELIVERY: Hypneumat designed and built a machine with a DQ56E series feed unit powered by a high efficiency on demand hydraulic power package and 7.5HP spindle motor. This drilling unit drives a custom 20 spindle adjustable heavy duty multi-head, drilling twenty (20) 1-1/4” holes in high-density polyethylene inlet tubes. The fixture is setup to rotate the part for drilling perimeter holes in inlet tubes and is designed to incorporate inlet diameters ranging from 12” to 48”. This machine is also capable of a wide range of rapid advance and retract speeds as well as variable drill feed rates. The drilling unit and multi-head are mounted to framework that can be raised or lowered to accommodate different inlet sizes.